The most popular megalithic site in Wales, Pentre Ifan is a splendid burial chamber with a huge capstone delicately poised on three uprights. 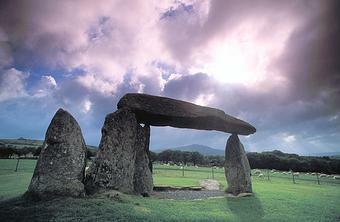 Once known as Arthurs' Quoit, Pentre Ifan means Ivan's Village. This monument, dating back to about 3500 BC and unusually oriented north-south, stands on the slopes of a ridge commanding extensive views over the Nevern Valley. The elegant capstone weighs over 16 tons; it is 5m (16ft 6in) long and 2.4m (8ft) off the ground. The stones of the chamber are all of local igneous rock; on the portal stone there is a faint decorative cupmark. Excavations in 1936-7 and 1958-9 showed that the burial chamber originally lay within a shallow oval pit, and that the trapezoidal mound of earth covering it was up to 36m (120ft) long. The semi-circular façade, as in the Irish court-tombs, was marked by two upright stones on either side of the south-facing portal. The forecourt was blocked with rows of tightly wedged stones; some of the original kerbstones around the barrow can still be seen. Within the cairn were a number of enigmatic features: a slumped stone, deliberately felled before the cairn was built, an irregular line of small stone-holes and a pit with signs of burning. No trace of burials was found here, but we may assume that such a large tomb would have been used for collective burial over many years. The number of artefacts discovered was very small; a recent analysis suggests that Pentre Ifan may be a structure built in two periods: the original portal dolmen tomb could have been later embellished by a cairn and a façade. Local lore says that sometimes fairies are seen here: they are described as 'little children in clothes like soldiers' clothes and with red caps'.